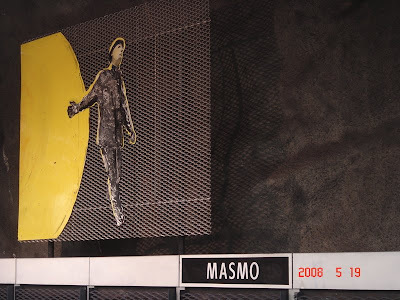 Thanks to artists Staffan Hallström and Lasse Andréasson there is artwork in the Masmo subway station as well. Several paintings share a common theme, "bring the sun down into the subway". I like the photo, and the art work, but Mao Zedong has entered my mind. Definitely a Mao flavor to all of this, I agree.